Forward players appear the best bet for fantasy football managers ahead of Gameweek 34. The Gameweek begins when Leicester entertain Newcastle on Friday evening which means all FPL team selections have to be made by 7pm. Six Premier League games then take place on Saturday, before Manchester head to Crystal Palace and Liverpool host Chelsea on Sunday. Arsenal are away to Watford on Monday, before there's an extra game to think about on Tuesday when Brighton host Cardiff. We've looked at players worth considering for the Fantasy Premier League and Sky Sports Fantasy Football competitions - the latter you can change captain for each game day, which adds extra significance to each game day. Here are our five players to consider for Gameweek 34. Leicester's striker has been having a party in recent weeks with eight goals in his last eight Premier League games. Vardy has been a man in form under new Foxes boss Brendan Rodgers and scored twice in Saturday's 4-1 win at Huddersfield. The former England striker has 15 league goals in total this season and Leicester entertain Newcastle on Friday evening. Vardy was on target when the Foxes won 2-0 at Newcastle earlier this season. Vardy costs £9.2m in FPL and £11.5m in Sky Sports and has 146 points in both competitions. After Harry Kane went off with an ankle injury in Tottenham's Champions League win over Manchester City on Tuesday, Heung-Min Son looks the best Spurs attacking option for their upcoming games. He has already scored twice in Tottenham's two games in their new stadium and they host rock-bottom Huddersfield on Saturday. Spurs also still have Brighton, West Ham and Everton to play at home. Son has 12 goals and seven assists in the Premier League so far this season. He costs £8.6m in FPL and £10.6m in Sky and has 150 and 154 points respectively. Brighton have two home fixtures in Gameweek 34 so a Seagulls player is worth considering. Albion entertain Bournemouth on Saturday before hosting Cardiff in a huge relegation six-pointer on Tuesday. 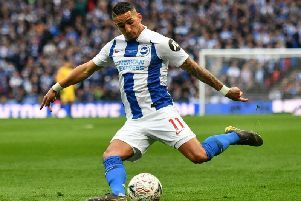 Anthony Knockaert has starred for Brighton in recent weeks after returning to the starting line-up and put in a man-of-the-match performance in their FA Cup semi-final defeat to Manchester City at the weekend. The French winger has scored two goals and provided six assists this season and will be a key player for Brighton in these two fixtures. He costs £5.2m in FPL and £8.4m in Sky and has 71 and 74 points respectively. Other Brighton players worth considering are top-scorer Glenn Murray and defender Shane Duffy, who has also scored five goals this season. With Marcus Rashford a possible doubt after missing United's defeat at Wolves last week, Lukaku could again lead the line. Ole Gunnar Solskjaer will be looking for a response after the loss at Molineux. Paul Pogba has been quiet in recent weeks, so Lukaku could be the man to bring in for this fixture especially as United will have one eye on the second leg of their Champions League tie with Barcelona next week. Lukaku has scored 12 goals and provided one assist this season. He costs £10.8m in FPL and £12.7m in Sky and has 108 and 127 points respectively. Everton have kept three successive Premier League clean sheets and left-back Lucas Digne could be a shrewd signing for Saturday's trip to relegated Fulham. Digne is also a set-piece threat going forward and has three goals and four assists this season. He is a better option for FPL managers than Sky as he costs just £5.2m in FPL compared to £8.2m in Sky. He has 123 and 132 points respectively this season. Other Toffees players worth considering include Gylfi Sigurdsson and Richarlison.